Work has been very busy and the weekend is a welcome break. Lucy and I wrap up warm and brave the cold winds on this Saturday afternoon, heading in to town for a spot of lunch. After a meander through North Laine, we pull up at Moksha Caffe across the road from St Peter’s Church. Moksha is a good sized cafe with a great choice of seating, whether you want to be cosy at the back of the cafe or ‘people watching’ out of the windows at the front. We walk to the counter and are warmly greeted by the staff who hand us our menus. We take a seat in the corner of the hustle and bustle of the family friendly cafe. Oli, the owner, comes over to talk us through the wonderful coffee list; his passion really shows. 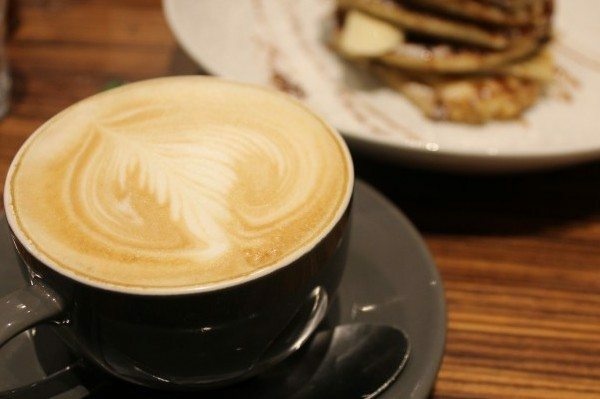 The artisan coffee is roasted in nearby Littlehampton which follows the theme of using fantastic local produce which Moksha Caffe is quickly becoming known for. I order my usual black coffee and Lucy, a flat white; you can instantly smell the quality before even putting the cup to your lips. A big tick straight away, this is a great place to have a coffee in town and get away from the crowds and we haven’t even ordered our food yet. It is now lunch time but with some new items on the menu I have to try the new Heuvos Benedictos. This comes with free-range chorizo sausages, free-range poached eggs, topped with avocado and tomato salsa, chipotle hollandaise sauce, served on toasted sour dough. What a treat to start the day; the chorizo sausages are some of the best I have ever tried and I am happy to hear they are supplied by Brighton Sausage Co. based just up the road. 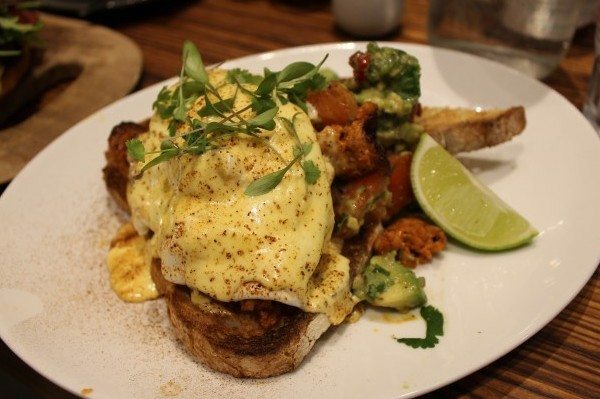 They are plump, juicy and fresh, the smokiness of the chorizo and the richness of the chipotle hollandaise are complemented so well by the runny egg and avocado salsa. I am such a fan of the traditional breakfast that I did not expect to be this blown away, add a little tobasco sauce and this is breakfast heaven. 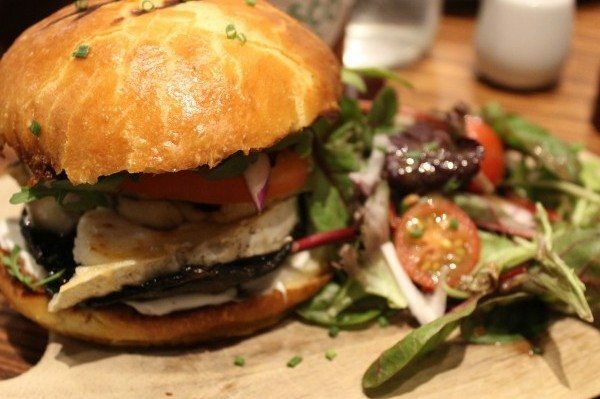 Lucy, on the other hand, has been enjoying vegetarian cuisine and has chosen the Mushroom & Halloumi Burger. 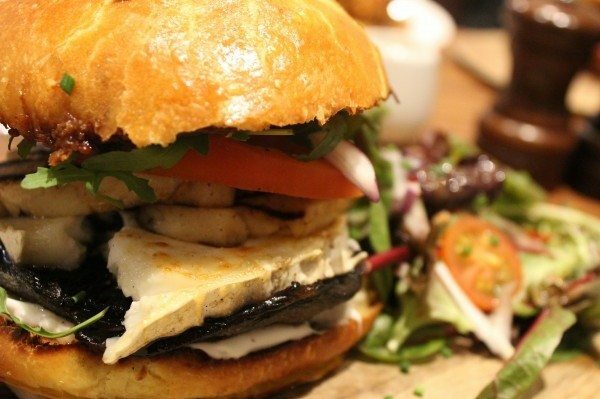 A grilled flat mushroom with melted goat’s cheese, grilled halloumi, a homemade chipotle BBQ sauce, fresh salad in a toasted brioche bun. 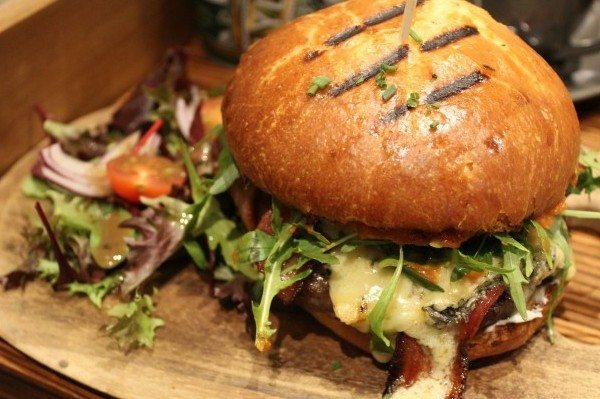 The burger is delivered on a board and looks amazing, the toasted top of the bun glistening, the cheese peeking out from the sides, draped over the mushroom; the delight on Lucy’s face suggests this is a taste sensation. She allows me a quick bite and I understand why, the mushroom is cooked perfectly, the cheeses stand up well together, add the homemade sauce and this just elevates the burger. Moksha understand fresh and great ingredients and sourcing all of the produce locally, this is a business to be proud of. So, jealous of Lucy’s burger and feeling rather ravenous today I also order a burger. They have recently added some wonderful new items to the menu and the Brighton Blue burger is a must. 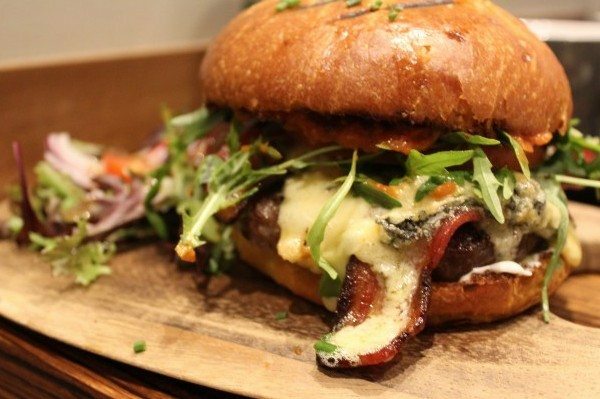 This is a 21 day matured beef patty, topped with award winning Brighton Blue cheese, smoked free- range Sussex bacon, homemade ketchup, mayo and salad, served as well inside that beautifully toasted brioche bun. I am less jealous of Lucy’s burger now, the patty is moist and holds together, you can taste the quality again of the local produce. As a bacon lover this is up there with the best bacon I have ever had. In one bun this is a superb burger; in a city now known for great burgers, Moksha has added themselves to the list, very high up the list! We are full and enjoying another coffee to avoid going out in the blustery winds. Oli the owner comes over to find out what we think of the food, as he has with every customer in the restaurant today. Not only is he proud of the fantastic food he is serving, he wants to make sure everyone is enjoying themselves, a real inspiration for any budding restaurateurs. Oli twists our arms and we to order a dessert, after proudly telling us how great his pancakes are we go with chocolate chip and banana. 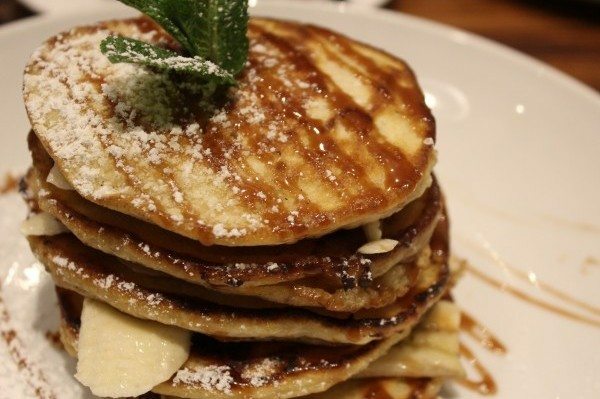 Out he brings a stack of enticing pancakes, layered with banana and chocolate chips in between, topped with rich toffee sauce and a dusting of icing, a real treat for a weekend. Lucy is so happy, though glad we are sharing, this is the kind of food no matter how full you are it is so delicious you have to squeeze in more, whether a pudding or a breakfast this dish is going to make you smile. At this stage we have a problem as we discover that the wonderful selection of sandwiches and cakes at the counter are all made in house and it would be rude not to try them. The team at Moksha work hard, continuously smiling, and now I find out the work and early starts that are involved each day to make the place so special. I feel obligated to try the cakes and Lucy’s sweet tooth is matching mine. We then find out we can pack some in a box as a treat for later, this is great news because we have only managed to whittle our choice down to three. 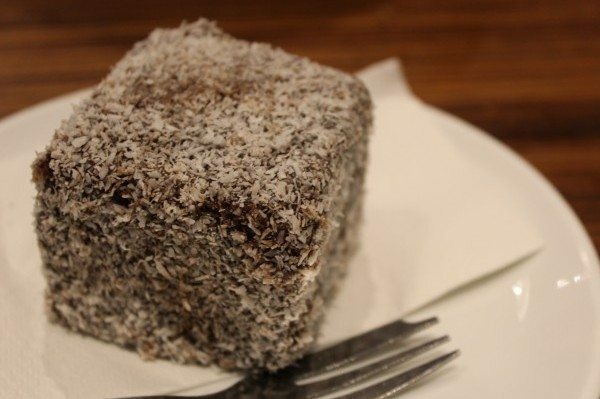 We chose a lamington cake, a cube shaped Victoria sponge with a homemade jam through the centre then coated in chocolate and rolled in coconut. It is a light sponge, with the chocolate, jam and coconut complimenting each other to deliver a great cake. My first experience of a lamington cake but it will certainly not be my last. We also try an Oreo cheesecake, another dessert I have not had the pleasure of trying. 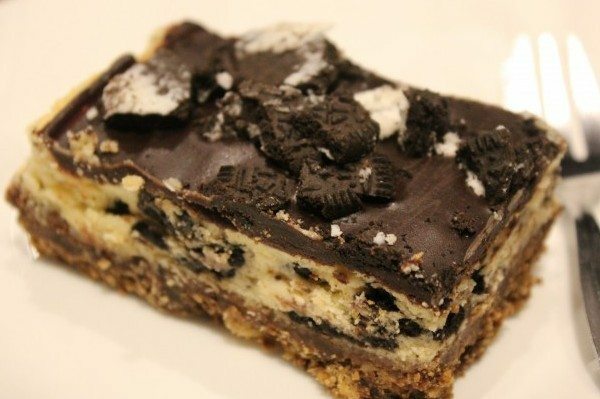 I’m not normally a fan of the Oreo but as a cheesecake the dark biscuit is taken to new heights and I am convert; a great way to take a popular dessert and give it a twist. Watch out for the Moksha desserts as they regularly change. Keep an eye out for this Easter’s treat, a Cadbury’s Creme Egg cheesecake, if you’re anything like me I’ll see you in the queue. Finally on the cake list Lucy asks to try the most important cake of all cakes, the Moksha carrot cake. Being mine and Lucy’s favourite cake and having been so satisfied by everything else today we cannot wait to tuck in. 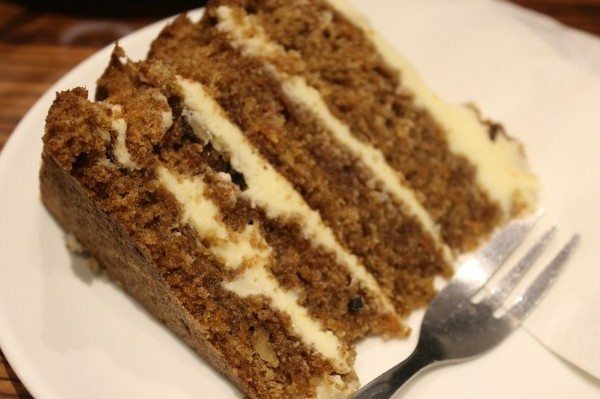 The first bite is amazing; the cake is moist yet surprisingly light, it is once again perfect. The icing offers a hint of orange and vanilla; this is sensational and tops off a wonderful start to the weekend. From a great welcome to attentive and friendly staff, Moksha has delivered well beyond expectations. Using locally sourced produce, the freshness and quality is noticeable throughout the coffee to all of the dishes. I cannot see any customer leaving without a big smile on their face. An establishment that knows how to cook great food and make the most out of every ingredient is a must visit for Brighton. 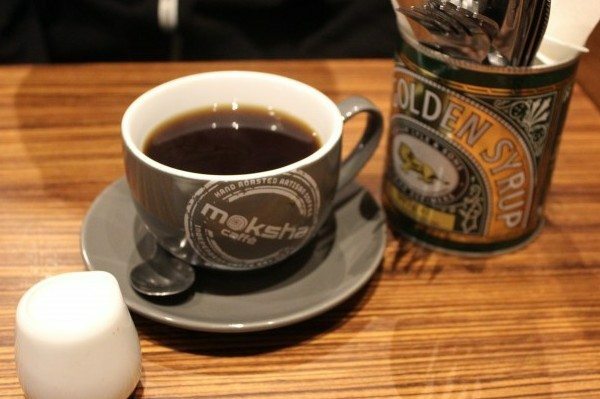 If you have not tried Moksha already then you must go soon, I guarantee you will be returning. You will see me at the back of the restaurant; I’ll be the guy with a stack of blueberry pancakes and some of that amazing smoked, free-range Sussex bacon.